“Artificial Intelligence: A.I.” was on cable last night and I after watching half an hour of the movie my opinion about it did not change after all these years: it is not Kubrick. I know that Kubrick worked on the project for many, many years and reading the movie trivia again I remembered that several details were chosen/decided by him, but I think it was just not enough; I find Spielberg to be a very boring director – and quite corny sometimes – so to me he shouldn’t have been chosen to work with something so dark and disturbing; leave it to Cronenberg, Fincher and even Nolan to deal with that kind of movie, and not someone who digitally replaces shotguns for walkie-talkies. But there’s one thing I like about “A.I.”: I find Jude Law perfect as Gigolo Joe – he’s such a versatile actor and one of my favorites. Preheat the oven to 180°C/350°F. Butter and flour a 10-cup capacity Bundt pan . In a medium bowl, sift together the all purpose flour, cake flour, baking soda, baking powder and salt. Set aside. In the large bowl of an electric mixer, using the paddle attachment, cream butter and sugar together until light and fluffy. Beat in the eggs, one at a time, and scrape the sides of the bowl after each addition. Beat in the vanilla and the bananas. In low speed, add the sifted ingredients in three additions alternating with the buttermilk, beginning and ending with the dry ingredients. Scrape the sides of the bowl again. Pour the batter into the prepared pan and smooth the top. Bake for 50-60 minutes or until risen and golden and a skewer inserted in the center comes out clean. Cool the cake in the pan over a wire rack for 15 minutes – in the meantime, make the glaze: combine butter, water and sugars in a small heavy-bottomed saucepan over medium high-heat and bring to a boil. Immediately reduce the heat to medium-low and simmer for 5 minutes. Remove from the heat and stir in the rum. Carefully unmold onto the rack and brush it generously with the glaze (you can save some to serve with the cake). Cool completely. Oh the rum glaze! What a splendid finale for the Bundt cake! Just sparkling! ha ha ha, I love your thoughts on Spielberg!! agree. That movie just made me mad. I think it's kind of unwatchable. Jude Law was the best thing about it! Are you excited about FALL TIME RECIPES?? Banana cake is always my favourite. I was convinced to see that movie by some friend who had loved it... I didn't at all!!! No more movie-advice taken from them, ever. 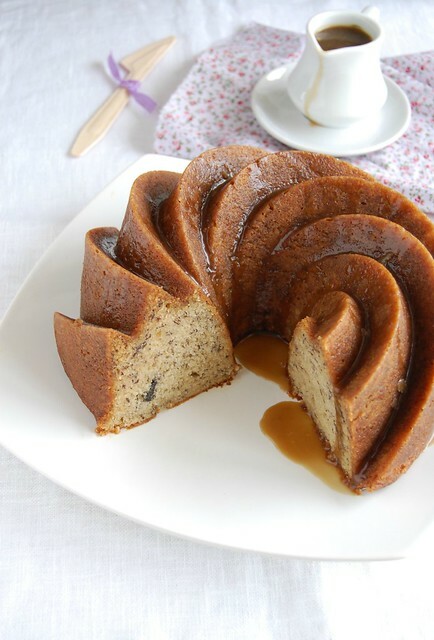 The swirl shape from the bundt pan is so pretty! And, the rum glaze sounds fantastic. Great idea! I've been meaning to comment for months now and just never got around to it but I've followed your recipe several times and I always come out with a very tasty and moist cake. Thanks so much for sharing this recipe. Tia, I'm so glad to hear that! Thank YOU for letting me know how the cake turned out for you!